I’m going to be hyperbolic. 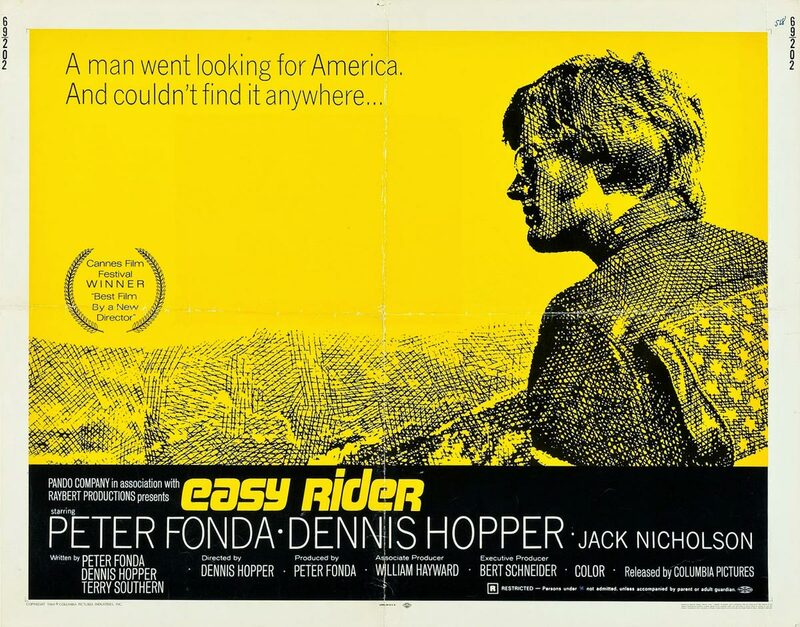 There’s a scene about 16 minutes into Dennis Hopper’s revolutionary counterculture classic and endlessly discussed Easy Rider that, to me, on a certain day, seemed so beautiful that I feel like it was among one of the loveliest moments in any movie I’d ever seen. That almost sounds absurd but I felt that way that day. And I’ve seen a lot of movies. Of course, this is a personal thing and not a definitive statement regarding all of cinema, nor how I feel on differing days – it’s individual and I change my mind. It’s even a bit mysterious to me. But the moment is something that goes beyond the picture itself, tapping into a memory or an impression of a memory and emotion that I am not even sure about. Why is this getting to me so much? Why is this so bittersweet? I love that this enigmatic stirring inside always, always happens when I watch the scene because I often think Easy Rider will feel overplayed – not overrated as some will say and I don’t agree with – but, overplayed, like “Led Zeppelin IV” (which is great, but I don’t often play “Stairway to Heaven” anymore) or the film’s title song itself, Steppenwolf’s “Born to Be Wild,” now so iconic and tied to the movie’s outlaws that it’s become easy shorthand for a kind of “Freedom Rock.” Or for all of those guys (and girls) who are really, really trying to get their motors running. Head out on the highway. Looking for adventure. You know the song. Anyone who forgets how tragic Easy Rider is may feel nostalgic for the Steppenwolf anthem, and it’s almost like a manifesto, a proclamation. But how wild can one be? Will the world allow it? The picture’s opening, before the famous “take the world in a love embrace” kicks in, might cause pause. Phil Spector. Cocaine. LAX. This transaction, so brilliantly staged, with the overhead planes drowning out the sound, is ominous and mystifying and somehow very American in its specific weirdness. Here comes a tiny, dandy, man-child Spector in a Rolls Royce looking demented even if we didn’t have any information on him (most of us do, which carries the picture’s darkness even further). Steppenwolf’s “The Pusher” plays – “Well, now if I were the president of this land. You know, I’d declare total war on the Pusher Man.” I say goddamn. Goddamn indeed – right away from that Spector detail, the picture hooks me and I realize, it’s going to hold up. And I’ve not gotten to the scene 16 minutes in. From when I first rented the movie as a teenager, and to the few subsequent viewings after, with long gaps in between (do I really need to see Easy Rider again? ), to recently re-watching it, the movie grew more complex and sad to me. And beautiful. And, this might sound strange, but it also felt permeated with a kind of panic that seeped into my nervous system – about life, something almost intangible. Feelings that go beyond all of the books I’ve read detailing the production history, or the politics of the era, or the glowing pieces or take-down essays or arguments about which movie was more revolutionary at the time, or anything about co-writer, the great Terry Southern (with Hopper and Fonda) or the craziness of the shoot (which is all important to read, and to know, and fascinating – here’s a making of, “Shaking the Cage,” and here’s Peter Biskind’s “Easy Riders, Raging Bulls”). George Hanson: They’re not scared of you. They’re scared of what you represent to ’em. Billy: What the hell is wrong with freedom? That’s what it’s all about. George Hanson: Oh, yeah, that’s right. That’s what’s it’s all about, all right. But talkin’ about it and bein’ it, that’s two different things. I mean, it’s real hard to be free when you are bought and sold in the marketplace. Of course, don’t ever tell anybody that they’re not free, ’cause then they’re gonna get real busy killin’ and maimin’ to prove to you that they are. Oh, yeah, they’re gonna talk to you, and talk to you, and talk to you about individual freedom. But they see a free individual, it’s gonna scare ’em. Billy: Well, it don’t make ’em runnin’ scared. We watch Wyatt and Billy riding their bikes, traveling through immense beauty, north of Flagstaff, Arizona through, what I believe is the Sunset Crater Volcano National Monument – where they (and we) take in all of the scrub pines that likely re-vegetated from a past explosion (I looked this up). The men point at the landscape as they look around half-focused on the road, they smile to each other, they appear happy, and they look . . . free. It’s enormously moving – I don’t think Fonda and Hopper are at all acting here – why would they need to? Here is all this beauty that partly, emerged from destruction, trees peppering and softening the dusty land amidst the mountains and rock. The music flows with shots of nature and their bikes, and, again those Kovacs’ lens flares that somehow manage to feel emotional to me. All of that – with their faces and their expressions – it doesn’t look like a travelogue but rather, a uniting of beauty. And, my god, is America heart-breakingly beautiful here. And, the nature of America, that part of America that people really should respect. The music comes to a semi-psychedelic turn when a striking, perhaps even ominous, Luke Askew, thumb out, hitches a ride. (He’ll take them to the commune that’s not exactly ideal). And then, it’s back to flowing along the road with nature, Askew riding with Fonda.